Through all of the twists and turns in the ongoing saga of Iran's nuclear program, there is a potential for military action to prevent Iran from developing a nuclear weapon. Iran insists it is only developing nuclear technology for peaceful, civilian use, but the West is skeptical and fearful. Iran's well-documented ties to international terrorism are a source of great concern for the United States, especially in the wake of September 11. So, if we do use military force to stop Iran from getting a nuclear weapon, what are the limits of that force? Using a tactical nuclear weapon on an Iranian military facility is one option that the President has kept on the table, but what are the moral implications of this policy? Specifically, how are we to justify the use of tactical nuclear weapons before God, considering that innocent civilians will likely die in such a strike? 1 Samuel 15:2-3 shows that the Bible is not universal in condemning use of force against civilians. Many historians believe that the use of nuclear weapons in Hiroshima and Nagasaki actually resulted in fewer deaths (on the Japanese side alone, not counting American casualties) than an invasion of the Japanese mainland would have. I would argue, as I said last summer, that nuclear weapons have been the greatest force for peace this world has seen since the end of World War II. 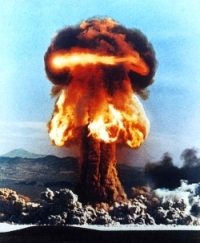 Had it not been for "mutually assured destruction", I am convinced we would have seen a fourth world war between the United States and the Soviet Union. Had it not been for the threat of nuclear annihilation, World War III would have brought untold devastation to Europe, the Soviet Union, the United States and the third-world countries where we fought our "proxy wars" for fifty years. We must use extreme caution with nuclear weapons and any consideration of using those weapons must be made with fear and trembling before a holy God, but I do not believe that the use of nuclear weapons is absolutely evil. While we have a responsibility to avoid violence against civilians if at all possible, we also have a responsibility to our own women, children and elderly here at home. Given the choice between blasting an Iranian military facility with a tactical nuclear weapon and having a terrorist set off a nuke in New York City, I will take the former every time. Iran isn't a political enemy, by the way. Iran is rogue state run by Islamist fanatics who would not hesitate to engage in genocide (of Israelis or Americans) if they could get away with it. Anything we do in terms of taking out their nuclear capability is pre-emptive self-defense. While any discussion of using nuclear weapons brings to mind images of a holocaust, no one is suggesting we wipe Iran off the map and kill every single man, woman and child in the country. The question here is the use of a tactical nuclear weapon and the collateral damage that nuclear weapon would cause. We cannot allow ourselves ti be overcome with pride as we consider the relative moral strengths of the American and Iranian foreign policies. Yes, America is run by sinful men and America is not God's chosen people like the ancient Israelites were. But pointing out the relative moral strength of the American moral position as opposed to the Iranian moral position in the standoff over Iran's quest for nuclear weapons is not an anti-Biblical or anti-Gospel stance. We must do as much as we can to avoid civilian casualties, and we have done so in both Iraq wars and the war in Afghanistan. I, for one, have never denied that moral responsibility. However, President Bush and the rest of our national leaders have a grave moral responsibility to protect the security of the American people. We cannot leave tactical nuclear weapons off the table if that is what is needed to prevent a mushroom cloud from appearing over New York City, Chicago, or Los Angeles. Ultimately, it is Iran that would be responsible for civilian casualties by intentionally locating military facilities in civilian areas so that collateral damage could be maximized.